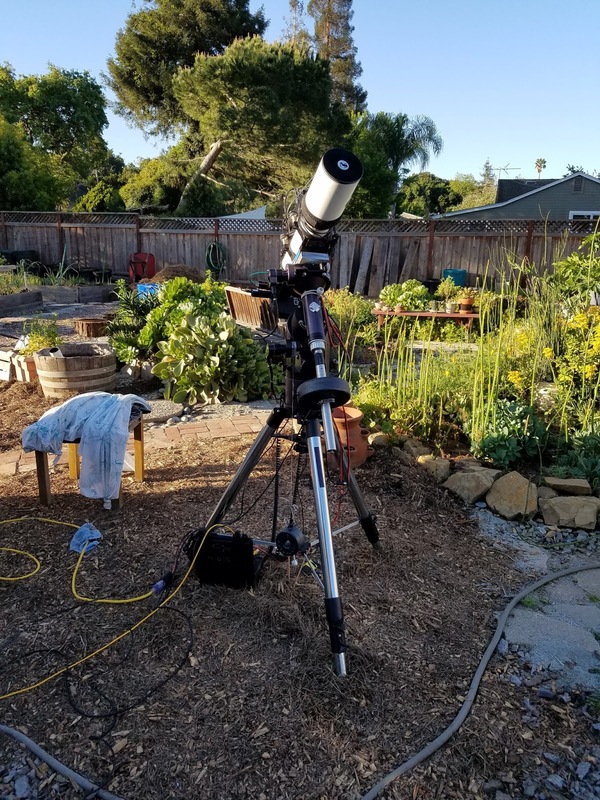 In February, I decided that I would try putting up a tripod in a semi-permanent location in the back yard. I had a Meade tripod from when I'd purchased the G11 head. This tripod had gathered dust in the shed and I finally decided that I could set it up and it wouldn't matter if it got some rain. As it turned out, there is very little rust-able metal in the build and thus it's good for long term use. With the Losmandy adapter in place, it's a very firm setup. When I put the tripod up, I used a tent stake to fix it to the ground. This was mostly to remind me of the location, add a little resistance to movement when it's not loaded, and prevent random tampering. Now that the rainy season is drying up, the clay soil will bake hard and cement the screw-anchor in place. 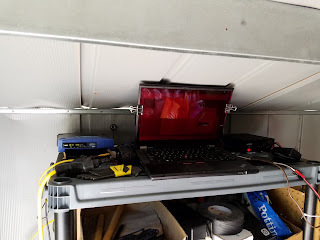 As a second part of the project, I wanted to convert the shed into the location for the computer and power supply, giving a more permanent feeling to the way that I'm using it. 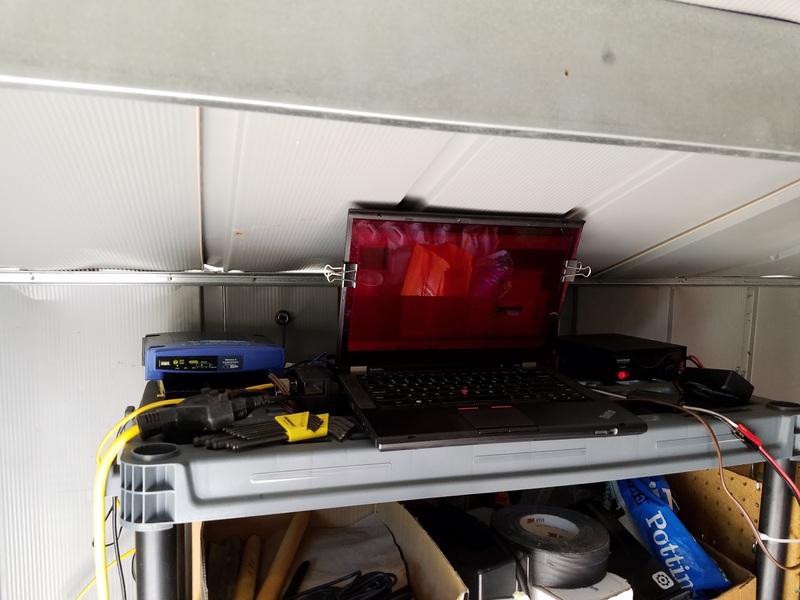 I cleared a shelf, drilled some holes for cables and to add two directional wifi antenna and lengthened the connections. 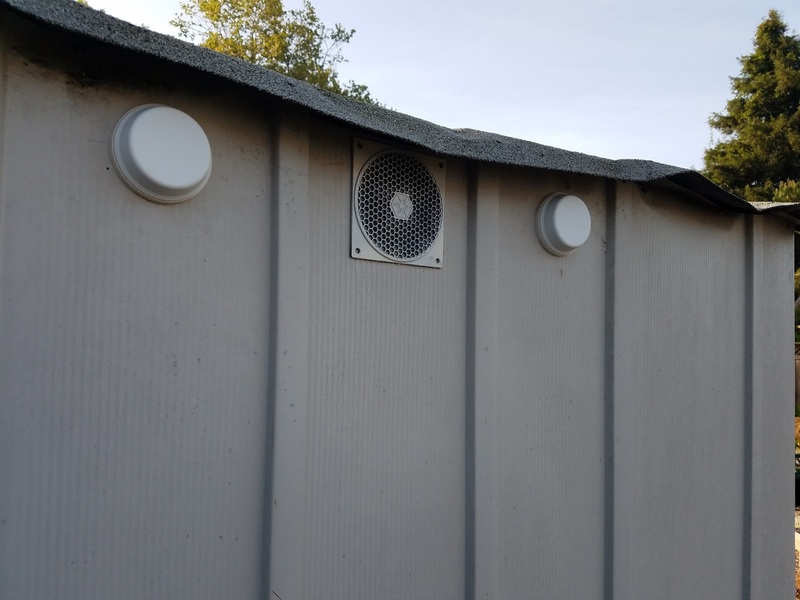 I was concerned about heat, so I experimented with adding a computer fan to the wall, providing active ventilation. 1. Always initialize CCDAP in the east. Also, make sure that the initialization completes properly. Quick guidelines: let CCDAP choose guide star and not Maxim. The latter program will choose the brightest star, the former will choose one that is not saturated, doing a better job of finding a real star and not a hot pixel. 2. Always let CCDAP's platesolves use the autodark option, as this will roll into the focus routine settings, making focus much more reliable. 3. Always let CCDAP choose the focus star via focusmax rather than letting Maxim do it. This will require a bit of slewing at focus time, but this should not cause too much delay. 4. Turn off focus temperature tracking. The focusers have not been measured to properly predict slope. 5. Turn off PEC until it's been properly measured. For every time it's been used on this setup, it makes the mount run slow and the curve causes a jump at the end. With the PEC off, the guiding can handle the fix on the fly. I did add a small .5mm spacer in the T thread chain. This should help tighten the stars a bit. I've seen the star images improve with this adjustment, with the exception of the extreme corners. When platesolves fail in CCDAP, be sure to set the subframe option for platesolves at 1/2. This will force the subframe size to be 1/2 the full size, improving the platesolve times and making sure that any glitches with bad subframe sizes are not copied. I had a lost evening where USB failures had entered bad data in the subframe size, forcing the platesolves to operate on images that had no stars at all. For the practice session in April and May, I never did a full webcam polar alignment. Just sighted along the polar scope. So far, there's been no need to tweak the polar alignment as it seems to be within 1 degree. I did try to use a laptop dock to make cabling less of an issue. This seems to have introduced some power and usb problems. Will be reverting back to a no-dock config. I've solved issues with USB problems by changing the USB cable to a 3.0 repeater cable. This is overkill for the task, but it does solve the problem. I have also learned to get spares of the active cables as they do fail alarmingly often.